It's frightening to think about how our Justice System here in America fails on a daily basis. Just recently, I had an experience with it myself. Not me personally. But a guy I know, a man very close to me, received a prison sentence for a crime that certainly had more to it than his Grand Jury ever heard. 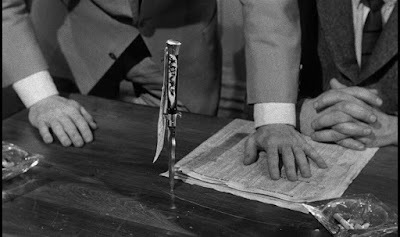 Not to say the crime in question in this case was as heavy as murder, as in the case of the unnamed 18-year-old boy that is the subject of debate in Sidney Lumet's 1957 film 12 Angry Men. But even so, Justice is supposed to be blind, it's not supposed to have a face. When 12 jurors enter into deliberation, it's impossible to have all parties blind. Human nature comes into play. Early in the film, as Juror #8 (Henry Fonda) is beginning his quest to shed doubt on a seemingly locked guilty verdict, he says the same thing I felt mere months ago when someone I love was convicted and sentenced to a prison term: "There're a lot of questions I'd have liked to ask...I began to get the feeling that the defense counsel wasn't conducting a thorough enough cross examination...I mean, he let too many things go by..." Number 8 is simultaneously skeptical of and enamored with the justice system. In that regard, we connect with this movie, for isn't this the way we all feel? 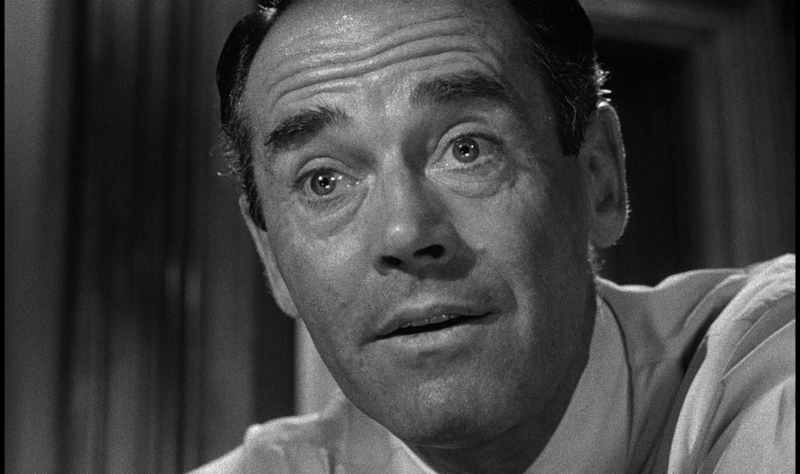 Henry Fonda as Juror #8 represents the type of idealism and bravery we all wish we had. Eleven men walked into that post-trial room sure of a guilty verdict. One man wasn't so sure. And it's not that he thought the kid was innocent, its that he though it was "possible." This word gets thrown around a lot in this screenplay. An attorney's job is to prove beyond a reasonable doubt. It's our job to verify that. How great! Screenwriter Reginald Rose's script reminds us of what we hold dear as Americans as what many once called "the finest Justice System in the World." 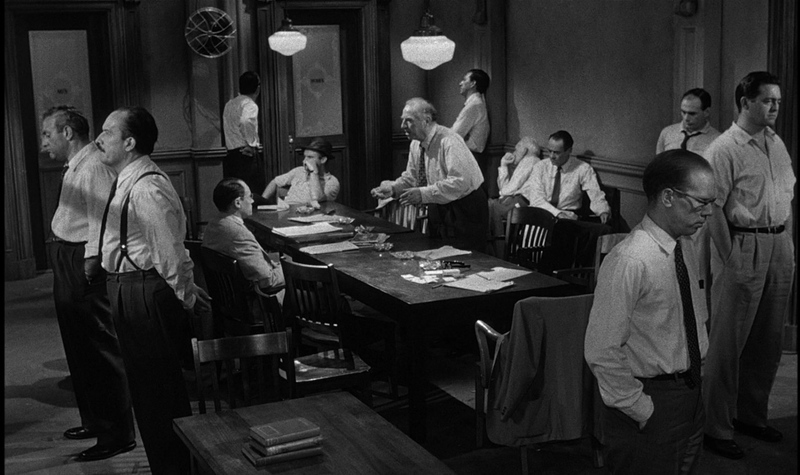 I can't say for certain that that's true anymore, but 12 Angry Men is a piece of brilliantly timed dialogue and debate that believes our system can be good. It is a nice movie about angry men, men who are angry about the wrong things. Juror #7 (Jack Warden) just wants to get to a Yankee game. Juror #4 (E.G. Marshall) thinks his intellect is so much greater than the others. Juror #10 (Ed Begley) is crotchety and sick with a summer cold. Juror #5 (Jack Klugman) feels slighted by the men's dismissal of this young defendant, a boy raised poor much like himself. 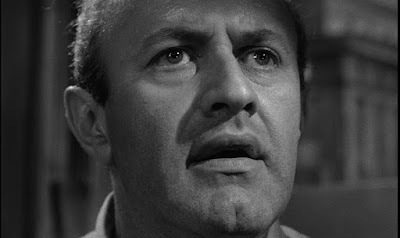 Juror #3 (Lee J. Cobb) is #8's foil. He is truly convinced of guilt. Watching Rose's script (through #8) just chip away at these characters in this sort of deconstructive psychotherapy is purely engrossing and entertaining. Rose's script was first presented as a teleplay and made as a TV special for CBS. The following year it was rewritten as a stage play before becoming a major success as a feature film. 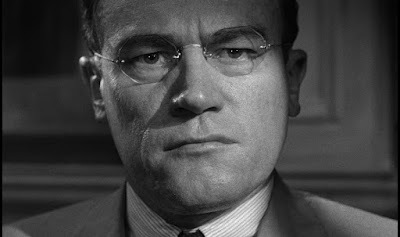 Sidney Lumet's direction is what makes this work as a movie. It is, in essence, a stage play. One room, one table, twelve chairs, a few windows, a broken fan, a few ash trays and some random papers. Lumet and Director of Photography Boris Kaufman take great initiative in establishing the room and table as the setting, even before the men enter the room. The camera pans over the empty table, the papers, the ash trays. Then, at the end, it does it again. This thing is beautifully shot, illustrating light and shadow, creating mood only the way black and white can. The greatest collision of script and camera comes through the way Lumet and Kaufman shoot these men's faces as they argue their points or hear someone else's point or ultimately succumb to Juror #8's doubt. 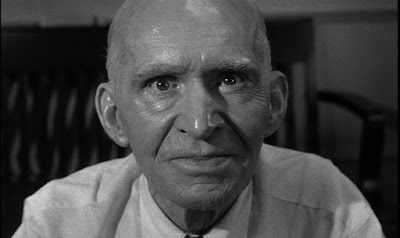 This is a close room, an intimate room by the end, and Lumet's camera gets right in their faces. The impression some of these images leaves is unmatched. The stories these faces tell, the way they're lit, letting shadows fall in certain places. This is what cinema is all about. This movie digs into our emotions by making us these men. It doesn't need a large space or multiple locations. It needs to tell us a story the old fashioned way...with appeals to the emotions in all of us. When this movie ended, I felt so supremely satisfied. This is what Blind Spot is all about. Shame for never seeing this movie before. Gratitude for finally getting to it. This movie deserves all the love it gets. It currently holds at #7 on the populist IMDb Top 250. I'd say that's about right, for few movies are as timelessly entertaining and meaningful. 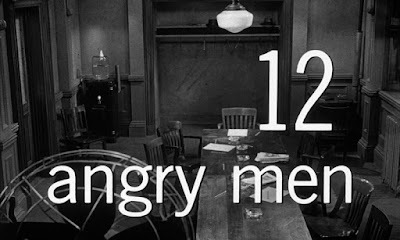 Sidney Lumet's 12 Angry Men offers us a glimpse into not only our Justice System but also the way in which we all desire Justice not only for an accused criminal on trial but also for ourselves. Twelve men walk into a room ready to send a kid to the electric chair without even thinking, one man reminds them that that is their duty, to think, to talk, to appreciate life. Great review! I love this film. I was so mesmerized with the way it worked - debunking one evidence one at the time - and watching the justice system at work. I liked how everything just came together and it was interesting all throughout. Thanks! It is really a perfect, totally watchable film. So glad to have finally seen it. This is such a wonderful movie! I'd love to see the play on stage, too. It is! And me too! Great review! This was one of my Blind Spots last year and it ended up being my favorite one. It's so well done. Thanks! This is definitely at the top of my Blind Spot picks so far this year. One of my All-Time Favorites. It takes balls to really embrace the stagebound nature of a play, and in this instance Lumet totally came up gold-plated. I've seen this onstage a couple of times and it's still pretty powerful stuff, but it can't compare to this film version. Yes! You said it. Lumet made this one set stage play really work as a movie.